Hi everyone! We’re back from easter vacation here in Norway, and we have a stable update for you guys today. 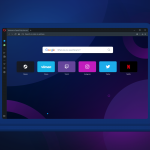 This update includes a chromium update to 41.0.2272.118, some HiDPI fixes on Linux and a crash fix on Windows.